Well, my big grocery store outing didn't quite work out yesterday because by the time it was time to go, I had lost most of my stamina and all of my motivation. So instead I made a quick run to our nearby, small grocery store and got some emergency items: cheese, bread and meat (for Sarah's lunches) and oatmeal. But today is the Big Day. Very shortly I will drive twenty minutes down the beach to the really big grocery store and make up for three weeks of non-shopping. I was going to run a couple errands along the way but then I wisely reconsidered and figured that one mammoth grocery store outing was enough for one day for my newly recovered self. So that's my excitement for the day. I bet you're going to have a hard time topping that! We got a call a few minutes ago from a certain College Dude who wanted to let us know he was in Georgia and had his little car pointed straight toward North Carolina. (Be still my heart.) He's due to arrive about 10 pm. I will go to bed a happy woman, knowing that both of my chicks are in their nest where they're supposed to be. And if Nathan thinks he's leaving in two weeks, well, he's got another think coming! Maybe if I hurry up and rob a bank in the next few days, I could have enough money to pay him for his new summer job called, "Staying Home With Mom." I was so happy to go by Sue G's site and see how many Smithellaneous people had stopped by and signed her guestbook. If anyone deserves to have her guestbook signed, Sue does. I can't tell you how many times I've been reading through different cancer websites and will go to sign the guestbook only to see that somehow, Sue G. has already been there before me. She spends a lot of time signing guestbooks and doesn't just say "Hi. I was here." No, if you've read her entries before, you know they're like something out of a book or a (well written) greeting card. She and her writing are amazing. So what I pictured him doing on his birthday (instead of blowing out candles on a cake) was spending lots of time (hours, centuries, millenia?) just running. And then running some more. And then being happy that he was able to run, able to breathe freely, able to be at peace in a land infused with the most joyous joys imaginable. Happy Birthday, Dad. We miss you! I'll close with a few pictures of him . . . This is after Sarah's bone marrow transplant. 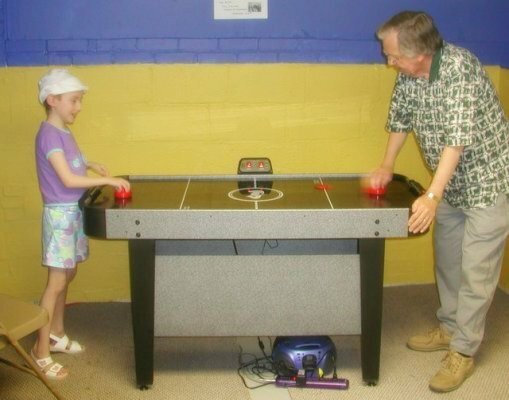 She enjoyed trying to beat her grandpa at air hockey. 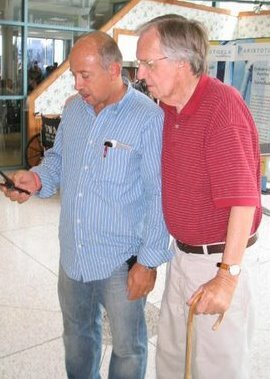 Dad with our unofficially adopted brother, Ron. In this picture, Dad had to use a cane. In heaven? No canes allowed. One of my favorite shots of him. 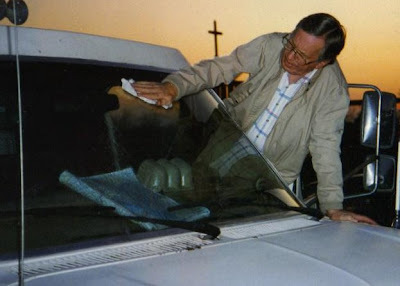 This was taken when he was on the road with us as we traveled from state to state doing concerts and services. He was the kind of person who was always trying to find something helpful to do. I love seeing him in this act of service, with the cross and the sunset behind him. Sarah and Grandpa. This one needs no words. Dad bought this guitar for me a long time ago, when I first started guitar lessons. 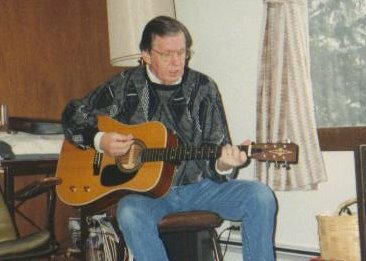 He really couldn't afford it, but he and mom were always my greatest champions and cheerleaders when it came to my music. After I switched to playing piano, he used the guitar himself and loved it so much. Unfortunately, it was stolen from his van about a year before he died. 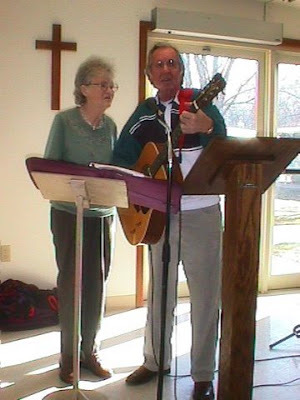 Mom and Dad--singing on earth, practicing for the eternity that they will sing together. Becky, your father was so surrounded by love when he died. I remember the photos of you all singing him to heaven, and of his beautiful cemetery. He certainly knew how important he was to all of you, and you must miss him terribly. Hopefully, you felt his hand in yours during these past weeks of struggle. Hope the shopping trip went well - baby steps, remember! How great that Nathan will be home tonight! It would be terrific if you could figure out a way to keep him home this summer. Becky, I am overwhelmed by the outpouring of support for me by your blog community. Thank you again for gently pushing them in my direction. The prayers are already working. I am experiencing less pain today, to the extent that I can actually walk without crying out. I feel very blessed and privileged to have so many people reach out. And it's all because they care so much about YOU! I hope you take that in. 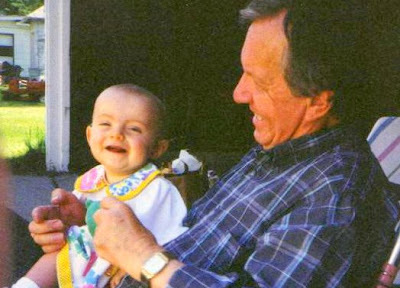 Your Dad and my Daddy shared the same birth date on earth and both celebrated their first birthday in heaven yesterday. We miss Daddy so much and know he is well and no pain. I told Mama tonight I was ready to give him up if he could not get better and not ready if he could. We realize he could not get better and the Lord prepared us even though it still hurts. So glad you went to the store and hope the large shopping today was great for you. Nathan should be home shortly so enjoy--enjoy--enjoy! Think of some "job" for the summer in Manteo. How about "beach bum" just doesn't pay much. Glad things are going well. Do you have a Walmart near by? I know there is not a Sam's Club. Good night for now. God is good to us as we both remember the past times with our Dads and rejoice. Hope Nathan is home safe and sound and you found some keys on the table and shoes by the door. I just loved your post about your Dad. Aren't we the lucky ones with kind and faithfilled dads. I am sure you are correct about him running around Heaven - it was really breezy and downright windy here the last few days - now I know who was causing all of it - it a birthday celebration! Still Praying. Hey Becky-Sorry it has taken me so long to sign in. I visit, I pray but I just have not taken the time to sign. I hope you are feeling stronger and stronger everyday. I am sure with Nathan home you are feeling much better. I hope you have received my "goody" I sent by mail.